Build the majestic Ferris Wheel, the star of the fairground! This delightful LEGO® Creator Expert model has an iconic elegance that evokes feelings of nostalgia, romance and adventure. The carnival has come to town and the ice cream vendor is busy serving a long queue of excited customers as they await their first ride on the magical Ferris Wheel that towers above the fairground. Slowly turn the crank and watch as the Ferris Wheel gracefully lowers the colorful gondolas into position for boarding. Raise the boarding platform with a simple pull of the lever, open the gondola door and help the passengers aboard! Have fun building this elegant model with an authentic charm and magic that will capture your imagination. You can also motorize the Ferris Wheel with the LEGO Power Functions 8883 medium motor and 88000 AAA battery box (not included). Includes 10 minifigures: a ride operator, ice cream vendor, 4 children and 4 adults. Price is 32% above the initial Lego retail price! This comes down to 10.14 cent per brick. 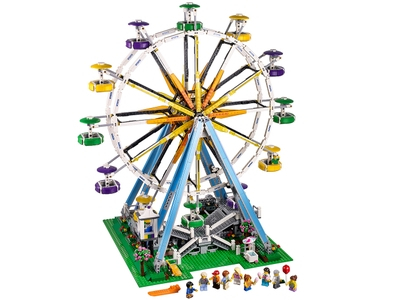 The Ferris Wheel (10247) Lego set is no longer directly available from the sites below. However, 3rd party partners of these sites might still have the set available. Alternate description Build the iconic Ferris Wheel, featuring 12 colorful suspended gondolas with opening doors, ice cream stall, kiosk, 10 minifigures and more.